APPLICATIONS FOR THE POST OF VIDYUT SAHAYAK - JUNIOR ASSISTANT on BEHALF OF GUVNL AND ITS SUBSIDIARY COMPANIES NAMELY UGVCL, DGVCL, PGVCL, MGVCL and GSECL. Graduate in any discipline with completed Regular / Full Time Course from recognized University. There is no minimum percentage requirement. The candidates should have working knowledge of computers and English language, which shall be assessed by the Company through pre-employment test. 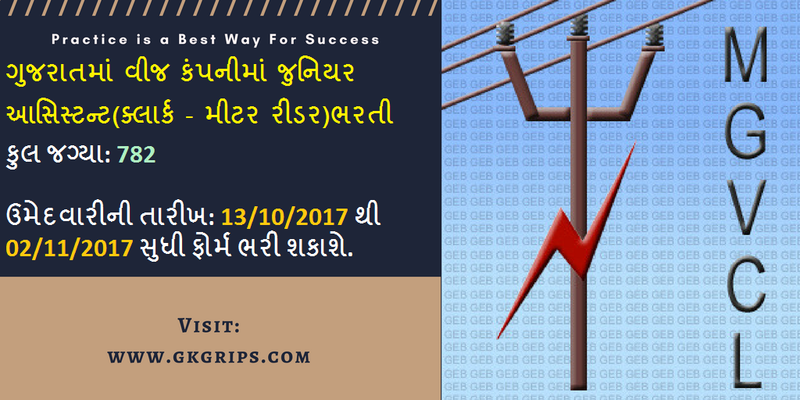 Madhya Gujarat Vij Company has issued MGVCL Recruitment 2018 Notification for 38 Vidyut Sahayak post. The Last date for apply is 06.08.2018. MGVCL Recruitment 2018 Advertisement For 38 Vidyut Sahayak Positio. Apply Online form for MGVCL Jobs on or before the last date 06.08.2018. RRB Syllabus 2019 is avilable for JE, CMA, & DMS Vacancies. Candidates must check Latest RRB Exam Pattern & Selection Criteria for JE Posts.